As the Chinese saying goes, “The top have policy measures, the bottom have countermeasures.” This refers to the ubiquitous political sabotage and intransigence that plague government in China, and firm control of personnel is the only way around it. Xi Jinping, China’s leader, is making a rash of personnel changes across China’s provinces, showing that he understands this principle. This organizational shake-up may place Xi at least one step ahead of the rival political faction led by former Communist Party chief Jiang Zemin, which continues to resist Xi’s rule. These changes are crucial in the lead-up to a decisive political conclave this autumn. In April, five Chinese provinces—Gansu, Hainan, Heilongjiang, Shandong, Zhejiang—received new Communist Party secretaries, and governors were replaced in four of them. Provincial Party secretaries are the most powerful officials in the Chinese regime’s 31 provinces, provincial-level cities, and autonomous regions; governors are second. The authoritarian nature of the Chinese regime means that the top provincial officials rule with largely unchecked power. Provincial leaders are also inducted into the Central Committee, a body of over 300 regime elites. The chiefs of regions like Beijing and Shanghai may even be appointed to the Politburo, a key 25-member decision-making body. Following the April personnel changes, 16 provincial chiefs and 18 governors are either loyalists of Xi or of his closest ally, anti-corruption head Wang Qishan, or else technocrats who owe their new promotion to Xi. When Xi took office as Chinese regime chairman in March 2013, only four provincial chiefs and three governors were in his camp. The situation is reversed for Xi’s political rival Jiang. In March 2013, 25 provincial chiefs and 24 governors were allies or supporters of Jiang’s faction. By last month, Jiang had only 15 provincial chiefs and 13 governors on his roster. Several of these are slated to retire about half a year from now at the Communist Party’s 19th National Congress, a key conclave held once every five years. Provincial leaders who are prominent members of Jiang’s faction could possibly be sidelined before the 19th Congress. Han Zheng, the Party chief of Shanghai, is particularly vulnerable, in light of intense anti-corruption efforts in the coastal city in recent months. Shanghai is home to Jiang’s infamous “Shanghai Gang” and is the longtime base of operations for Jiang and his kin. Xi’s personnel edge over Jiang, however, doesn’t necessarily translate into fuller political control. Jiang was Party leader from 1989 to 2002, and then became a powerful backroom operator in the next decade during the reign of his successor, Hu Jintao. Jiang’s long period of political dominance allowed him to condition the Chinese regime officialdom to respond favorably to corruption, kleptocracy, and abuse of power. Xi has sought to arrest the culture of malfeasance left by Jiang through an anti-corruption campaign. Many of the over 200 top officials and more than 1 million lower-ranking cadres who have been purged for corruption are allies or affiliates of Jiang. Xi has met with pushback that threatens the Chinese economy and social stability. The massive capital outflow from China in recent years can be attributed in part to Chinese officials moving their often ill-gotten finances abroad to escape investigation. Property bubbles have also developed in various cities and regions due to corruption and speculation from local officials. Economic policies are not being enforced because Chinese officials are passively resisting them. 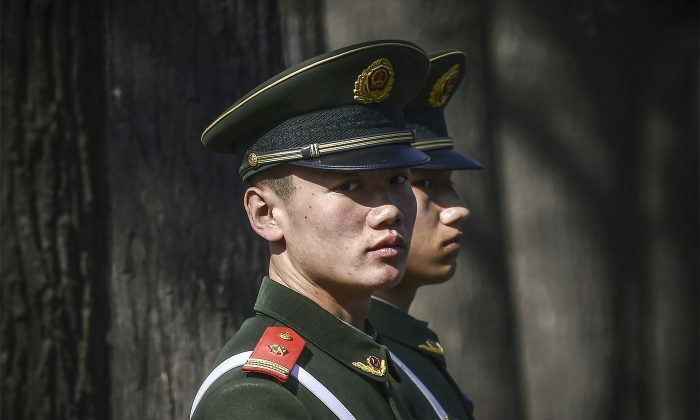 Xi has publicly advocated that the Chinese regime rule “in accordance with the law.” But the regime’s security and legal apparatus at times still operates in the repressive and unlawful manner that was typical under purged security czar and Jiang ally Zhou Yongkang. In 2016, five Beijing police officers wrongly arrested and beat to death Lei Yang, an environmentalist from a middle-class background. Even though Xi openly called for a transparent administration of justice for Lei, the police officers escaped prosecution. Many middle-class Chinese were enraged and troubled by the verdict, particularly because they presumed that police violence was limited to blue-collar workers or persecuted groups. Xi has responded to the pushback by the Jiang-conditioned “deep state” with more corruption investigations. Presently, at least 19 elite officials have been purged from the regime’s Political and Legal Affairs Commission, the Communist Party organization that oversees the prisons, the courts, and the public security apparatus. But the anti-corruption campaign will never be a permanent solution to fix a rotten cadre corps or the deep systemic corruption embedded by Jiang, according to Don Tse, an expert with China affairs website China Decoding. As long as the Chinese regime is in power, Xi always will be forced to resort to the regime’s repressive tactics to clean out the officialdom and retain firm control over the masses, Tse explained.